Dame Jocelyn Bell Burnell, whose Nobel Prize was given to her male colleagues instead, gives £2.3 million Breakthrough Prize to counter bias in physics research. I thought I couldn't admire her any more but ..
Jocelyn Bell Burnell: what a role model. Astrophysicist. Quaker. Failed 11-plus. Discovered pulsars as a student. Nobel prize went to her supervisor but now gets a £3million prize & gives it all away to fund physics studentships for women, & minorities..
Astrophysicist Jocelyn Bell Burnell wins $3m prize, plans to channel it into a fund to help women, under-represented minorities and refugee students become physicists. So so great. A Legend. Dame Jocelyn Bell Burnell donates her £2.3m Breakthrough prize to fund women, under-represented ethnic minority and refugee students to become physics researchers. Now that’s putting your money where your mouth is! 👏👏👏 Breakthrough Prize winner & astronomer Prof Dame Jocelyn Bell Burnell will donate her £2.3m winnings to fund women, ethnic minority and refugee students to become physics researchers. Fantastic news! 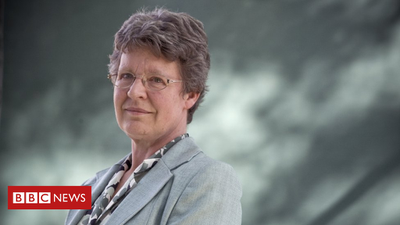 Prof Dame Jocelyn Bell Burnell has been awarded a Breakthrough Prize for the discovery of radio pulsars & will donate the £2.3m prize find to fund women, under-represented ethnic minority and refugee students to become physics researchers. Congratulations to Prof Dame Jocelyn Bell Burnell, and to the founders and judges for the Breakthrough Prize for doing what the Nobel Committee wouldn’t. She’s donating the prize money to support women, minority, and refugee students in physics. Dame Jocelyn Bell Burnell, one of the brightest stars in Northern Ireland's shimmering scientific firmament, is to donate her prize money to advance diversity in science. Bravo! If you needed proof that Jocelynn Bell Burnell is the best of all people, it’s arrived. Jocelyn Bell timeline 1967 Key role in discovery of pulsars 1974 Misses out on the Nobel because of her gender 2018 Wins far more lucrative US$3M Breakthrough Prize 2018 Donates winnings to a scholarship to counter unconscious bias. Think about that. “I don't want or need the money myself and it seemed to me that this was perhaps the best use I could put to it.” What a wonderful ray of light amid so much gloomy news. BBC News - Scholarship to counter 'unconscious bias' in physics. Article by @BBCPallab Nicely done by Jocelyn Bell Burnell. Prof Dame #JocelynBellBurnell has been awarded a #Breakthrough Prize of £2.3 million for the discovery of radio pulsars. She has donated it to a fund to help women, under-represented ethnic minority and refugee students to become #physics researchers. This is amazing! Well done to Dame Jocelyn Bell. Really wish this had been around when I was a physics undergrad. Would have helped so much. I aspired to be a researcher but had little mentoring or support. In the end felt it was too difficult to balance. Prof. Dame Jocelyn Bell Burnell is giving away her £2.3m science prize to fund women, under-represented ethnic minority and refugee students to become physics researchers! Scholarship to counter 'unconscious bias' in physics - BBC News bbc.com/news/science-e… We discussed this together over coffee a few weeks ago, such a cool and inspiring woman!!! Prof Dame Jocelyn Bell Burnell was scandalously excluded from 1974 Nobel Prize for her discovery of Pulsars; impressed she has given her £2.3M Breakthrough Prize to fund women, under-represented ethnic minority and refugee to become physics researchers. Hats off to Jocelyn Bell Burnell. She did not get the 1974 Nobel prize for her discovery of radio pulsars. Male coauthors did. She is now donating £2.3 million to fund women, under-represented ethnic minority, and refugee students to become physicists. Jocelyn Bell Burnell status ascends from legend to "god-like"
Prof Jocelyn Bell Burnell to donate £2.3M for physics scholarship to counter bias: "I have this hunch that minority folk bring a fresh angle on things and that is often a very productive thing. In general, a lot of breakthroughs come from left field." Prof Dame Jocelyn Bell Burnell: not only inspirational as a scientist and human, but also a tangible, cold hard cash, champion of women and minorities in science. Donates £2.3million prize for supporting underrepresented groups in physics. #WomenInSTEM #GenderEquity #Physics One of the UK's leading female astronomers is to donate her £2.3m winnings from a major science prize she was awarded. bbc.co.uk/news/science-e… knowing it will be 258 years before the gender ratio of senior physicists comes within 5% of parity! Bell Burnell was not recognized when her work lead to the 1974 Physics Nobel, but now she's using her new $3M Breakthrough Prize to help underrepresented students become physicists.